See "scientific staff" tab here. For further information or loan requests, please contact the Collection Manager or Curators. The California State Collection of Arthropods (CSCA) is an international resource for research and identification of various groups of the Phylum Arthropoda, especially Insecta. The total number of prepared specimens exceeds 1.5 million, making this the 6th largest collection in California; the policy of retaining primary type specimens has only recently been instituted, so few are currently included (although a vast number of primary types have been designated from our materials, and deposited in other collections, particularly the California Academy of Sciences and the Essig Museum). The CSCA is maintained by the Entomology Lab of the Plant Pest Diagnostic Branch of the California Department of Food & Agriculture as an integral feature of the identification services provided to the citizens and business interests of the State, and our peers and colleagues both nationally and internationally; two curators directly supervise the care, use, growth and development of CSCA, which includes both traditionally preserved specimens and specimens preserved for molecular research. We encourage the use of this collection for research on the taxonomy and systematic relationships of any arthropod taxa. The collection is comprised of specimens acquired mainly from the collecting activities of current and past CDFA staff all over the State of California and surrounding states and in many parts of the world, as well as from samples and specimens accumulated from interceptions at California ports and inspection stations and submitted for identification, and from specimens and collections donated to increase representation of certain taxa and to enhance our understanding of general insect diversity. There has been a more recent (since 2003) on-going survey effort in collaboration with California Department of Parks and Recreation, with extensive Malaise trapping programs in State Parks throughout California. The CSCA includes a fully functional state-of-the-art Frozen Tissue Collection (CSCA-FTC) for the long-term preservation of arthropod DNA. This was established to meet the needs of the newly-developed and ever-growing number of diagnostic and systematic entomology research activities that employ DNA-based (i.e., molecular) methods. The CSCA collection had humble beginnings with the organization of the State Board of Horticulture in 1883, the precursor to the Department of Agriculture. In 1913, a State Insectary was established in Sacramento to serve as the repository for the specimens accumulated by the State Board of Horticulture and other State agencies. These subsequently were presented to the Bureau of Entomology of the Department of Agriculture, with early contributions from employees E.O. Essig, H.S. Smith, T.D. Urbahns, H. Compere, and others. With the establishment of the Insect Identification Laboratory in 1928 by W.C. Jacobsen, H.H. Keifer, previously with the California Academy of Sciences, was appointed curator and identifier, bringing a new stability and vigor to the collection. At that time, the collection consisted of about 200 Schmidt boxes. By 1960, there were nearly 100,000 identified specimens representing more than 8000 species, and an additional 50,000 specimens yet to be identified. This rapid accumulation resulted from the agency playing an active role in pest survey and control work, quarantine enforcement and related services, and general inventory collecting. In the next 11 years, the collection increased to over 300,000 identified specimens representing over 20,000 species. Most of this growth was sparked through hiring Marius Wasbauer in the early 1960's and Fred Andrews and Alan Hardy in the late 1960's; in addition, several significant collections were donated, including those of Ken Cooper (Carabidae), David Kissinger (Curculionidae), and Louis Gentner (Chrysomelidae: Alticinae). 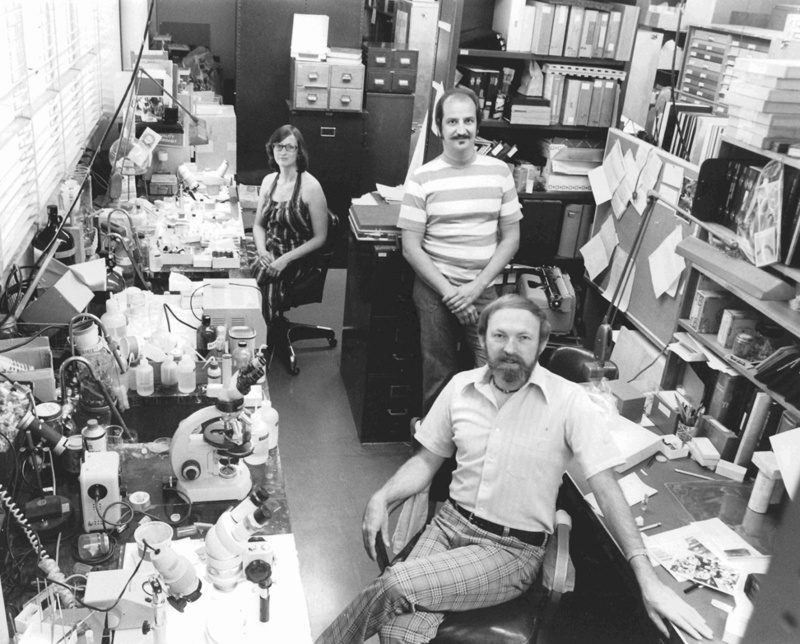 By 1993, the taxonomic Analysis and Identification Unit (now the Plant Pest Diagnostics Branch) had a staff of 12 systematists, and the collection had grown to over 900,000 pinned and labeled specimens, 120,000 vials of alcohol preserved specimens, 30,000 slides, and 5,000 enveloped specimens. Over the last decades, the collection has experienced steady growth at a rate of about 50,000 specimens accessioned per year, to a current total of over 1.5 million specimens. Because of the nature of a taxonomic identification and diagnostics unit, nearly 75% of this has been identified to species, and more than half of these materials represent the California fauna, either native or introduced, although there are also significant other New World holdings, and a worldwide scope is represented for many groups. Significantly, the CSCA holds specimens representing the first detections of exotic species that have since been eradicated or have since become established in the State, including many in the CSCA-FTC, in anticipation of future molecular work on such species. On 16 May 2000, the arthropod collection at the Plant Pest Diagnostics Branch of the California Department of Food and Agriculture was designated by the State legislature as the State Collection of Arthropods. 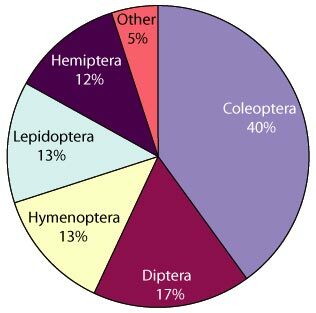 The approximate taxonomic representation of major holdings is shown in the figure above. The CSCA is maintained by the scientific and technical staff of the PPD Entomology Lab, including a Collection Manager. The expertise in the lab, with 10 full-time systematic entomologists (and one to several postdocs at any given time), covers a wide range of insect and related arthropod biodiversity, and so the collection is growing in all parts. This makes the CSCA one of the largest concentrations of insect systematic expertise under one roof in the United States. The consistent hiring of systematic entomologists when staff retires indicates the State's commitment to the field, and its recognition of the importance of accurate and timely diagnostics. The current, enthusiastically collections-oriented staff have furthered the development and expansion of the collection to even higher accession rates than the past. For all users of the CSCA, including Research Associates, the following general guidelines apply (a more detailed Collection Management Policy is being developed): Loans will be made to all qualified researchers in accordance with general conventions about the borrowing and care of natural history specimens; specific rules and requirements are attached to CSCA loan forms (e.g. : loans are made for a period of 2 years, renewable; primary types must be returned; etc.). All specimens loaned from the CSCA will be listed on a loan form, copies of which are signed by the borrower and a curator; the retention of identified duplicates is allowed in consultation with a curator per the guidelines given here. For specimens loaned from the CSCA-FTC, all voucher materials from molecular studies will be returned, in addition to aliquots of any unused resulting products. Arrangements can be made for use of the CSCA facilities for short- or long-term visitors engaged in scientific research and collection work. Access to the support resources of CSCA, e.g. the library, the various literature files, computers, etc., will be subject to the same rules as collection use. Library materials and literature will not be loaned, although photocopying on-site is permitted. Those publishing on subjects that include specimens from CSCA or CSCA-FTC should list this coden in their publications, although the older CDFA and CDAE have been in use for years. Those wishing to donate specimens or collections to CSCA can receive documentation on such donations for tax purposes. No evaluation or appraisal will be given. Specimens submitted for identification or donated become the accessioned property of the CSCA. Permanent retention of duplicate specimens from CSCA is only allowable for those identified to species level. No specimens sorted only to family, genus/subgenus or species-group may be retained. Unique specimens and pairs may not be retained. Also, the widest locality data possible must be represented in CSCA, thus unique-locality specimens may not be retained; retained specimens should be duplicate of at least one other from the same locality. A maximum of 8 specimens per species identified may be retained, as follows: male – 3rd, 6th, 9th, 12th; female – 3rd, 6th, 9th, 12th. All primary types are to be returned to CSCA. Paratype series may be split differently, on a case-by-case basis, with further retention allowable only for distribution to other collections (i.e., not adding to the 8 specimen maximum for the author). The CSCA-FTC has the capacity to store over 30,000 samples at -80˚Celsius. Already preserved in the collection are over 1,400 DNA samples and over 2,200 samples of DNA voucher specimens (specimens from which DNA has been extracted) or whole identified specimens (whose DNA is preserved and may be extracted in the future). The exact location within the freezer and specific information associated with these samples is saved in a custom, protected Filemaker Pro v9 database that is served to the entire PPDB research and technical staff. The databasing of this material is critical for maintaining information regarding each of the specimens and for easy access to the specimens themselves. The taxa held in the CSCA-FTC can be searched via the CSCA inventory database. The database can handle all material processed through the PPDB entomology lab, whether the samples originate as PDRs, donations, or research material and assigns exact freezer spaces for deposition as the material is acquired. For all databased samples, the collecting locality/PDR information is retained as well as specific information regarding its determination (determiner, date of determination, etc.). This data is linked to all information regarding DNA extraction and molecular diagnoses if present. The data is also linked, of course, to corresponding voucher material, with exact locations in the freezer for the DNA, the DNA voucher specimen, and remaining samples from the same collecting event, if present. The CSCA-FTC also houses Mediterranean fruit fly DNA samples generated by Bruce McPheron and his lab at Penn State University. The data for these samples, originally created by the McPheron lab, has been integrated into the CSCA-FTC database and now information regarding each of these samples can be queried in a number of different ways and their exact location in the freezer is known. Concise labels indicating critical voucher information are produced by the database and are placed with all associated physical specimens. For DNA extractions, labels are created using a small-font thermal printer with extremely resistant adhesive that is able to withstand harsh conditions including very cold temperatures. These labels are standardized so that information regarding each sample is consistent, complete, and easily read (as opposed to hand-written vial labels). The labels are affixed to the outside of each DNA-containing vial to indicate its contents and database association. The proper curation and long-term preservation of specimens and their DNA is critical for DNA-based services that are now routinely provided by the lab. We hope that Research Associates will support the California State Collection of Arthropods (CSCA) in our attempts to enhance and improve this scientific resource. Possible avenues of support include giving time and expertise to improve the state of the collection holdings, and donating specimens and library resources to the CSCA. Along with independent research activities, research associates can collaborate with Entomology Lab staff on various projects, including systematics studies on agriculturally important arthropods. Research Associates can also help document and describe the unique and diverse fauna of California and the rest of the western United States. A possible outlet for publication of original research is the soon-to-be resurrected and improved "Occasional Papers in Entomology" series, which we plan to make electronic in the near future. Appointment as a Research Associate is for a period of three years, renewable at the conclusion of each period; individuals can serve as long as they maintain an interest in supporting the CSCA.